Military • Disability-claims backlog in SLC grew 343% in past few years, outpacing all but two regional offices. 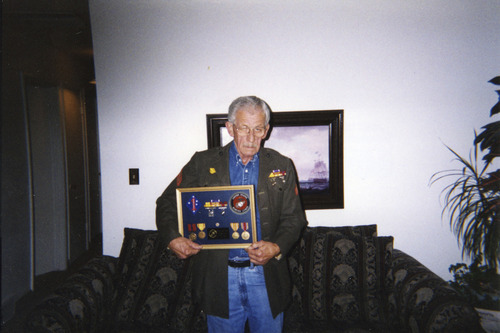 Courtesy photo Walt Youse holds a shadow box with the Purple Heart ribbon and other medals and awards he earned in the Pacific Theater in World War II. Youse died two years ago, before the Department of Veterans Affairs could decide whether he deserved disability pay for his war injuries. Francisco Kjolseth | The Salt Lake Tribune Eric Shinseki, secretary of Veterans Affairs, visits the VA regional office and the George E. Wahlen Veterans Affairs Medical Center on Tuesday, June 25, 2013. The press event came during his morning visit to the regional office, which handles benefits claims for veterans from around the country. Steve Griffin | The Salt Lake Tribune Justin Youse was injured during his service in Iraq and he continues to struggle with back pain. Like many veterans across the country, he had a long wait -- two years --before the Department of Veterans Affairs resolved his disability claim. Steve Griffin | The Salt Lake Tribune Justin Youse was severely injured in the Iraq war, and continues to have problems with his back. He is one of the many veterans whose claims for disability pay was slow in coming from the Department of Veterans Affairs. 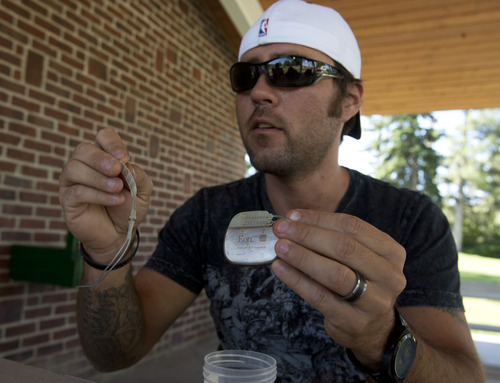 In a park near his Bountiful home, Youse holds up the spinal cord stimulator that helped him deal with his pain. The device was defective and was later removed from his back. Steve Griffin | The Salt Lake Tribune Justin Youse was injured during his service in Iraq, and he continues to struggle with back pain. Like many veterans across the country, he had a long wait -- two years -- before the Department of Veterans Affairs resolved his disability claim. Walt Youse died before the Department of Veterans Affairs could decide whether to compensate him for his World War II disabilities: shrapnel in his shoulder and foot troubles stemming from the jungle rot he suffered in Japan. His grandson, Iraq veteran Justin Youse, fared a bit better. Youse was caught in the nation&apos;s third-fastest growing backlog  the VA Regional Office in Salt Lake City saw a 343 percent increase in its backlogged claims in the three years ending Jan. 7, according to data collected by The Center for Investigative Reporting and analyzed by The Salt Lake Tribune. The nationwide backlog grew by 98 percent in that time. But after two years of deliberation and denials, Veterans Affairs agreed in December that during his service in Iraq 10 years ago, Youse permanently sacrificed his ability to hold a job. He is one of hundreds of thousands of veterans across the nation who wait months and even years for VA to decide whether their country owes them for injuries and maladies caused by their service. The military drawdown associated with two wars ending  Iraq in 2011 and Afghanistan in 2014  amid a sputtering economy is flooding VA with claims from new veterans, even as the agency is aggressively advertising its benefits and making it easier to claim payments for PTSD, Gulf War illnesses and exposure to Agent Orange. The number of disability claims has rocketed, from 391,127 the week President Barack Obama took office to a high of 822,520 in March. More than two-thirds are from vets seeking a higher disability rating and more compensation; the other third are first-time filers. Claims at the Salt Lake City VA office followed the national trend, soaring from 5,528 in mid-January 2009 to 22,704 in March. 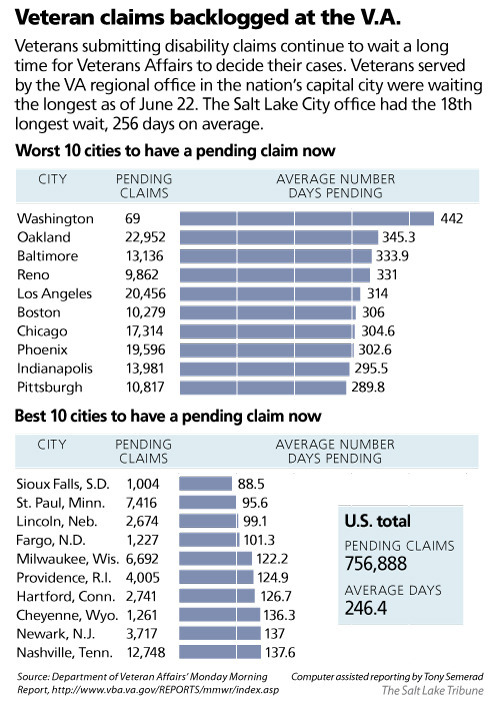 But unlike the nation, the number of claims filed in Salt Lake City is still climbing. The office had 23,491 claims pending as of June 22. Youse&apos;s lengthy fight for a 100 percent disability rating based on his broken back and post-traumatic stress disorder (PTSD)  added to his grandfather&apos;s experience  left him disgusted. Though Walt Youse had a Purple Heart and other documentation, he gave up pursuing a disability claim after a frustrating cycle of rescheduled medical exams and other hassles. He died two years ago. "They put so many roadblocks up that you just go away," Youse said. &apos;We are committed.&apos; • VA Secretary Eric Shinseki, who was in Salt Lake City on Tuesday, noted that the Salt Lake City office handles more than just claims from Utah veterans: It also processes claims filed by service men and women west of the Mississippi as they leave the military. So far this budget year, such claims  called Benefits Delivery at Discharge  comprised 65 percent of the 11,295 claims completed by the Salt Lake office, according to VA. The office also handles claims for veterans in Alaska and Montana, although numbers are reported separately for each state. "We ask a lot of Salt Lake," said Shinseki. His ambitious goal now is to have VA decide every disability claim within 125 days  four months  with 98 percent accuracy by the end of 2015. Claims older than 125 days are considered part of the backlog. 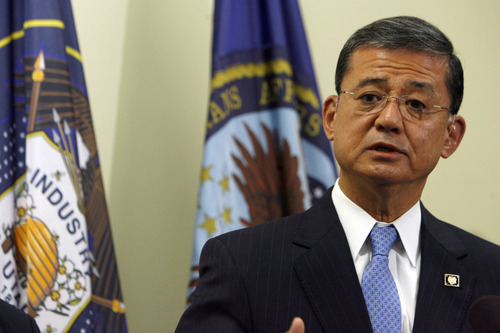 "We are committed to [that goal] and I am confident we are going to achieve it," Shinseki said. "Today&apos;s veterans … wait too long to receive the benefits they&apos;ve earned. That has never been acceptable." While the agency has made some progress since March, virtually wiping out claims older than two years by mid-June, the task ahead remains daunting. As of June 22, 756,888 compensation claims nationwide remained pending, with two-thirds of them older than four months  a backlog of more than a half million claims. Salt Lake City had 17,158 backlogged claims. But the proportion of such claims in its caseload was edging down, from 76 percent in March to 73.4 percent on June 22. 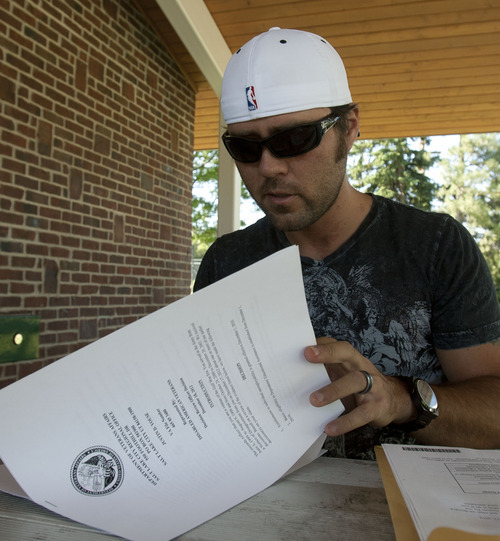 Jon Skelly, director of the Salt Lake City office, said only 1,000 Utah veterans have pending claims that are more than a year old, and that&apos;s the next batch his claims workers are plowing through. Like workers in VA offices around the country, the claims processors among the Salt Lake City office&apos;s 577 employees are working on mandatory overtime through September as part of the initiative to bring down the backlog. &apos;It&apos;s solvable.&apos; • Only 22 percent of the nation&apos;s pending claims are from veterans of the Iraq and Afghanistan wars. The rest are from prior wars and peacetime, with Vietnam War vets  at 36 percent  comprising the largest group. Robert Vert, 64, is one of them. An Army police officer in Vietnam, he turned to Rep. Jim Matheson, D-Utah, in February for help. Vert had repeatedly tried  and failed  to get more disability pay for PTSD and for the inexplicable weakness he has suffered for decades. After he enlisted Matheson, VA upped his disability rating to 70 percent in June. "If it weren&apos;t for the congressman I don&apos;t think it would have happened," said Vert, who lives in West Valley City. Nationally, critics are dubious that VA will meet its 2015 goal of ending the backlog. Rep. Jeff Miller, chairman of the House Committee on Veterans Affairs, said in a June 20 speech: "VA has been overpromising and under delivering for decades under both Democrat and Republican administrations." Miller, a Republican from Florida, wants Obama to create a task force to figure out how to best end the backlog. The Byzantine system VA uses to decide each veteran&apos;s benefit, created by Congress over decades, is designed to treat vets benevolently, requiring minimal evidence of injury or illness. But the process is mired in an accretion of laws, rules and procedures. "What it comes down to is, it&apos;s an enormous bureaucracy," said Jacob Worrell of the Iraq and Afghanistan Veterans of America. 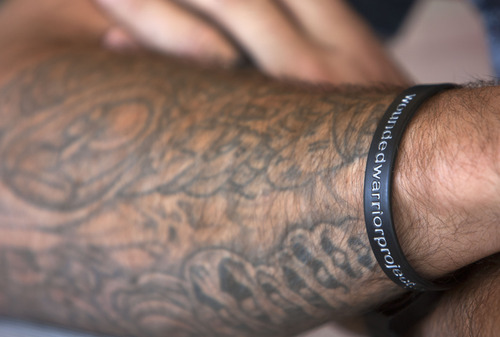 Its new website, thewaitwecarry.org, highlights the wait individual veterans are enduring. "At the end of the day, it&apos;s a paperwork issue. It&apos;s solvable," said Worrell, a veteran himself. "It&apos;s not like we&apos;re trying to put a man on Mars." Counting the cost. Terry Schow, who retired Friday as executive director of Utah&apos;s Department of Veterans Affairs, believes much of the criticism of VA for the backlog is unfair. A big share is due to Shinseki&apos;s desire to do right by Vietnam vets, said Schow, who served in the Special Forces in Vietnam. Although the agency completed 1 million claims a year for the past four years, it was getting more than 1 million new ones every year. And each veteran claims more injuries and illnesses than in the past, making claims more complicated, he notes. "Beating up on them is not the answer," said Schow. "We need to realize the sheer number we&apos;re dealing with." Youse, the Iraq war veteran who waited two long years, is less understanding. "Had they kept up with it, they wouldn&apos;t be in such a hole right now," he said. Waiting took a toll, said Youse, who lives in Bountiful with his pregnant wife and stepson, and now receives $3,166 a month. "It&apos;s about making your mortgage payment, not losing your truck. It almost cost me my family," he said. "It cost me my trust in the VA. It darned near cost me my sanity."